Both Warm & Natural and Warm & White are 4 oz. 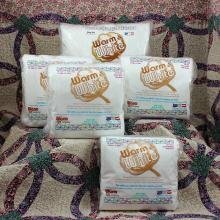 per square yard, but Warm & White feels a little less lofty due to the bleaching process which strips the fibers of their natural oils, while at the same time reducing shrinkage. There is little to no measureable shrinkage in a cold or warm water wash after quilting. When looking for a finished quilt that will remain pristine without puckering around your quilted lines, Warm & White is the perfect choice!